It seems we have impeccable timing, as just yesterday we published a great editorial on cooperative gaming and arcades. Last night at their CES 2010 keynote, Microsoft has announced Gameroom for Xbox Live and Games For Windows Live. What is Gameroom? 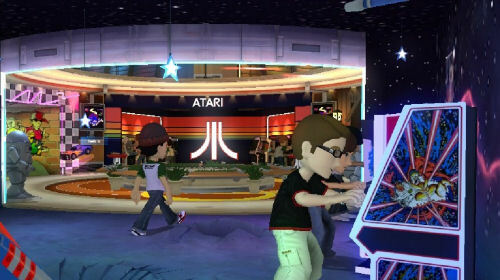 It's your own virtual arcade for your Xbox Avatar that you can fill with cabinets of classic arcade titles you purchase. In the space you can arrange, customize and decorate your arcade and then invite your friends over to play. The unique thing about Gameroom is that every game purchased through it can be played on either the Xbox 360 or a PC with Games For Windows Live. It'll cost you 400 per game, and if you don't care about the cross platform version it's only 240 . Finally you can play any game for a virtual 50 cents, or 40 , just like the real arcade. Every game also has a unique set of achievements on both platforms.. While it seems competitive games will be the focus at first, with friend challenges, leaderboards, global challenges, and other competitions taking place - games can be played locally or online. There's 30 days set to launch with the service this spring from publishers like Atari, Intellivision, Konami, Activision, and more. Hopefully we'll see some of those great co-op titles we talked about yesterday, as new releases are promised weekly. What (co-op) games do you hope are available on the service? Page created in 0.6339 seconds.